Art from Britain the sister company to Artists Harbour, publishes British artists� work as prints, greeting cards, etc. to galleries and retailers, and online. Artists Harbour sells artists� originals and printed works direct to the public. This Special Edition canvas is defined as a �Heritage Print� because it is a historic picture, sold to mark three historic anniversaries (see below) and in aid of a heritage conservation project � preserving the Mary Rose. The Mary Rose Trust aims to raise £35 million to preserve the historic Tudor warship for future generations and house it in a permanent, purpose-built museum together with its 19,000 Tudor artefacts. The triple anniversary special edition is numbered and limited to prints sold between October 21st 2007 and December 31st, 2011 ~ the end of the 500th anniversary year since The Mary Rose�s launch. the current Lord Cowdray, whose family lives at Cowdray Park. Rear-Admiral John Lippiett, Chief Executive of the Mary Rose Trust. The publishers certify that the finest modern light-fast materials and techniques have been employed so that if kept away from direct sun/uv light, moisture and humidity this picture will remain beautiful for many years. 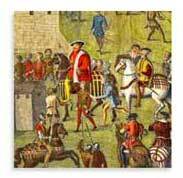 In 1509 the first orders of England�s young Henry VIII as King included building two warships, the Mary Rose and the Peter Pomegranate. Henry later became known as �Father of the Royal Navy�. The Mary Rose set sail barely two years later, the pride of English craftsmen. Over the centuries, Britain�s navy built traditions of duty, strength, sacrifice and heroism upon her foundation. Little wonder, then, that the Mary Rose holds such a special place in British hearts. The Mary Rose was probably the most advanced warship of her day, described by historians as the world's first true warship. Conceived with radical new design to be a fine, fast vessel, she was one of the earliest purpose-built warships in the world and probably the first into battle with gunports in her sides. The gunports increased her field and weight of fire and paved the way for that most deadly naval tactic, the broadside. Contrary to the urban myth that the Mary Rose sunk on her maiden voyage, she was in fact a successful warship and flagship, active with distinction for 34 years. She sank with all 500 hands in the Battle of the Solent while manoeuvring to fire on a gigantic French invasion fleet, sailing far out in front of her fellow English defenders. The sea claimed the great ship in 1545, locking her starboard side in mud under 50 feet of ocean for 437 years. Nevertheless, the Mary Rose literally defeated time and tide when, on October 11, 1982, 60 million TV viewers watched her resurrection from the waves and, over the following 25 years, she was subjected to intensive, non-destructive desalination and drying � surely amongst the greatest feats of marine archaeology and conservation. She is the only accessible 16th Century warship in the world. Now, at last, the purpose-built warship Mary Rose is ready for and needs a purpose-built museum reuniting the national icon with her Tudor crew�s 19,000 artefacts, from longbows to buttons. This picture is a masterpiece of 16th Century maritime art showing the Mary Rose sinking as King Henry VIII witnessed the event. It is sold in aid of the Mary Rose Trust, which needs £35 million to preserve this very British ship for future generations and build a permanent museum to make her accessible to everyone.